For the third straight year the Bishop Miege Stags are the kings of Class 4A-I earning the 2016 championship with a one-sided 53-21 win over Buhler, who entered the contest with an identical 11-1 record. The Stags' potent attack was in full effect on Saturday as they scored 46 points before Buhler was able to cross the goal line. "We wanted to come out and play hard, we heard all week long how physical they were going to be and how they could run the ball," Bishop Miege head coach Jon Holmes said. "Our kids took offense to that and really wanted to make plays." Miege scored the first points of the game on their second possession less than four minutes in. With 8:05 showing on the clock, quarterback Carter Putz hit senior Landry Weber for the TD to put Miege up 7-0 and the Stags would never trail. Less than two minutes later it was the Miege special teams turn to get in on the action. A blocked punt was scooped up and ran into the end zone by Miege linebacker Chase Delger to push the lead to 14 with 6:36 to play in the first. "That was huge, we've been coming after punts all year," Holmes said. "On that play we had a senior block it and a senior score on it. That's awesome to see seniors step up and make plays in a game like this." The Stags went back to the air for their next two scores, which came by the 7:17 mark of the second. On the first play of the second quarter, Putz aired it out to senior Jafar Armstrong for a 68-yard TD pass. A successful 2-point conversion put the Stags on top 22-0. A third TD pass for the Stags went from Putz to junior running back Cameron Clark, who sidestepped then raced past the Buhler defense on an 85-yard screen pass to make it a 29-point advantage. Jake Heyen's 41-yard field goal in final seconds of the first half gave the Stags a 32-0 halftime lead. Miege kept it rolling in the third quarter with another blocked punt, which Peyton Hamrick took in for six less than two minutes into the half. A 34-yard TD pass from Putz to Armstrong made it 46-0 with 4:43 to go in the third. Buhler avoided the shutout thanks to a 34-yard touchdown pass with just over one minute left in the third, but the Stags got that score right back. Just 21 seconds into the fourth, Armstrong caught his third TD pass of the game and Miege went up 53-7. The Crusaders added two late, fourth-quarter scores to account for the final margin as they end their season at 11-2 and runners-up in Class 4A-I. 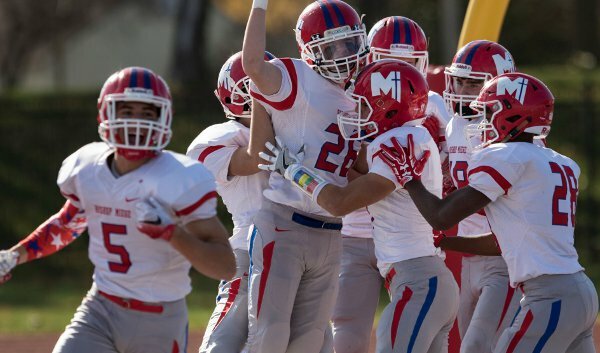 Miege (12-1) rolled to the state title winning 12 straight games by an average of 41 points per game. "This senior class has been huge for our program losing just four games in and winning three state championships in four years," Holmes said. "These kids mean the world to us and our school. I'm just proud we were able to send them out with a win today." RUSHING: Miege: Brison Cobbins 11-49, Carter Putz 6-18, Landry Weber 1-12, Ta’Von Tusa 2-3, Cameron Clark 1-0, Graham Mertz 1-(-1). Buhler: Jack Goertzen 19-115, Jordan Hawkins 6-67, Dalton Brown 16-47, Jhett Burkhart 4-33, Ethan White 6-17, Ben Epp 3-3. PASSING: Miege: Carter Putz 13-21-0, 329; Graham Mertz 1-1-0, 5. Buhler: Ethan White 6-25-1, 76; Ben Epp 2-3-0, 49. RECEIVING: Miege: Armstrong 8-219, Clark 1-85, Weber 3-23, Heyen 1-5, Gleason 1-2. Buhler: Smyres 4-87, Brown 1-16, Burkhart 1-15, Webb 1-4, Goertzen 1-3.